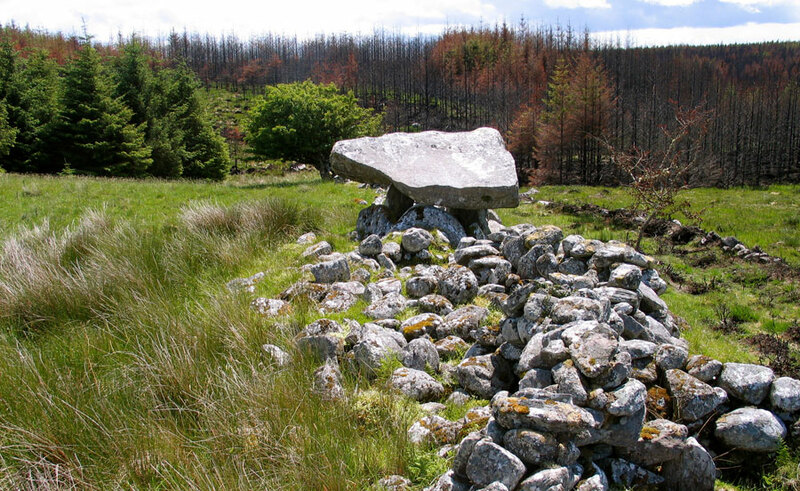 The Giant's Griddle stone is a fine neolithic dolmen near the top of the Easkey river valley. 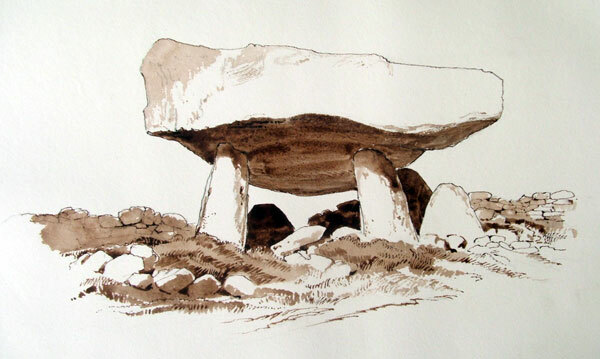 The dolmen is said to have been a cooking site of the Fianna, the band of legendary iron age warriors. It is superbly situated on a rise 100 meters from the river. The Easkey river valley in the west of County Sligo, between the northern slopes of the Ox Mountains and the sea, had a large number of megalithic monuments, at least 15 sites according to the Megalithic survey. Several are destroyed and many are in a poor state of repair, lost amid the bogs on the northern foothills of the Ox Mountains, but several fine examples remain and there are sure to be many neotlithic features such as walls and hutsites under the bog. 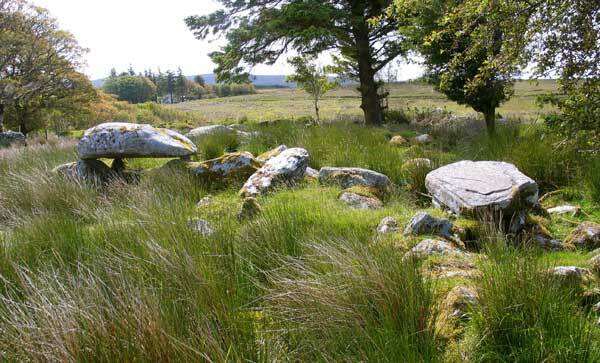 Many of these court cairns and dolmens are known as giants griddles or Griddlestones, and the giants were Fionn MacCumhail and the Fianna. The griddles were said to have been the cooking sites of the Fianna, who used to roam the countryside, hunting and camping as they patrolled Ireland There are many myths about Fionn all over Ireland. Fionn Mac Cumhal's stone, the Split Rock, Easkey, County Sligo. 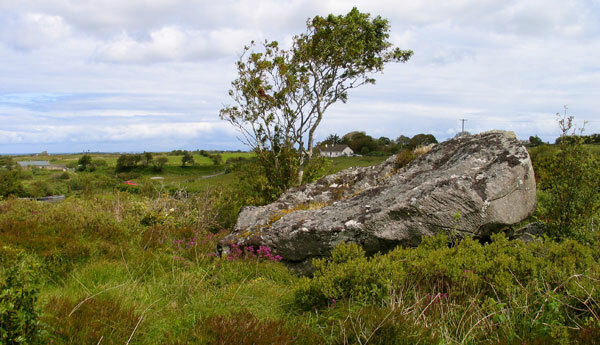 Fionn's Stone is a large boulder in a field near Easkey. The rock is a huge chunk of gneiss, 6 meters long by 2.5 meters high, that was carried north from the Ox Mountains by the retreating glaciers, the great winter cailleach of Sligeach, at the end of the last ice age. Traditionally large and unusual stones are linked to a hero, or saint, and this said to have been cast here by Fionn Mac Cumhal from the summits of the Ox Mountains during a giants stone-throwing competition. Furious that his cast did not reach the sea, he leaped down and struck the stone with his sword and split it in two, and so it's other name, the Split Rock of Easkey (which means Fishy). Local tradition says that should you walk through the crack three times it will snap shut on you. William Wakeman's illustration of the Giant's Griddle, from the 1870's. Image © Sligo County Library. 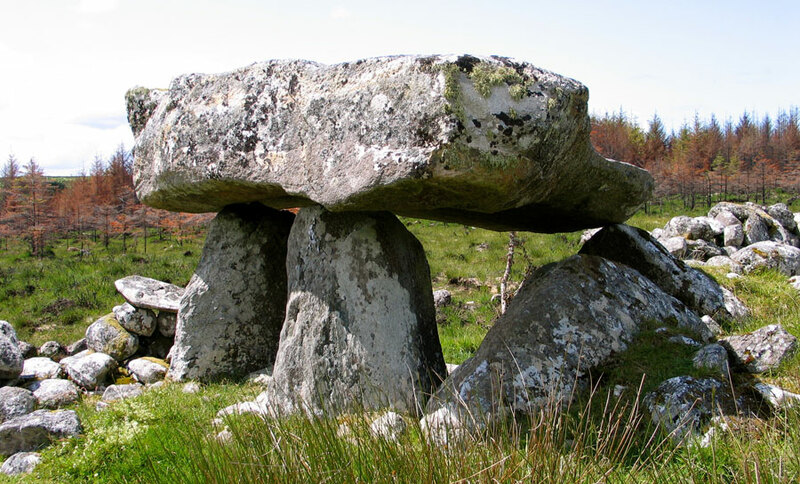 There are four huge dolmens in the same rough area of bog in the upper Easkey river valley, all located near fast flowing streams. 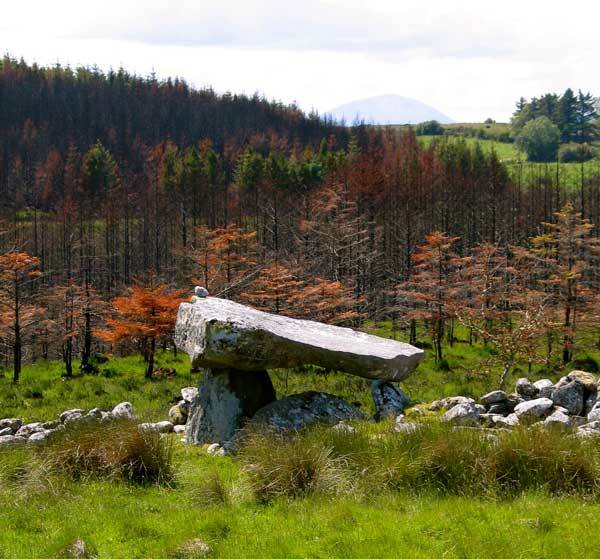 The Tawnatruffan dolmen or Giant's Griddle is found near the top of the Easkey river valley. 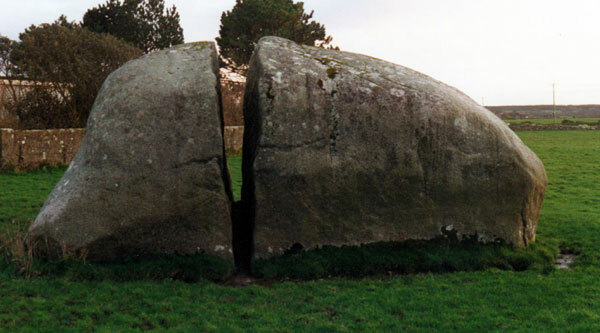 It is one of the most graceful of the Irish dolmens, with a beautiful soaring capstone that looks different from all angles (see a set of photos by Ken Williams). The monument is is hard enough to find, surrounded by forestry, well up the back roads to the mountain, but well worth the effort. Bring OS map 24 with you. The fine capstone is thought to weigh about 15 tons and looks just like a massive slab of meat ready for cooking. Tawnatruffan is sited close to the stream, a perfect location for a portal dolmen. Another of Wakeman's paintings. Image © Sligo County Library. The monument was visited by the artists Beranger and Bagari on their 1770's tour of Connaught. It was a day they would never forget, as described in great detail in their account; they got lost in the fog and were convinced they would die in the bog. 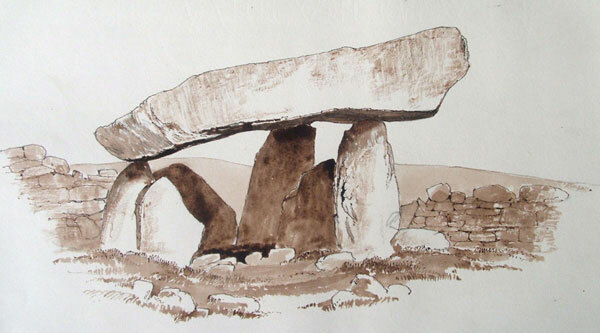 The dolmen was sketched by William Wakeman on his tour of the monuments of County Sligo in the late 1870's. Wakeman is said to have found a horseshoe-shaped engraving on stone near the dolmen. The chamber stone is missing from the west side, but apart from that this megalith is well preserved and worth a visit. View from the Giant's Griddle to Nephin Mor, the mountain in the west. The last time I stopped off at this megalith was not long after the bog fires in west Sligo, around Easter 2011. The area of forestry around the dolmen was burned extensively as can be seen in the above photo. It is also a good example of how monuments are sited in relation to local landscape features. The great cone Nephin is the main feature for monuments in North Mayo, and is also visible from many sites across the bay in west Sligo. Nephin has a cairn (which I have never visited) marked on the summit. The huge capstone of the second large dolmen or griddle near Tawnatruffan. Nearby, and again in a classic location, is another griddle with a massive quartz-studded capstone, which has partly collapsed down on its portal stones. This monument is located about 100 meters by a fording point over the river. The fabulous capstone may weigh 20 tons or more The monument is quite overgrown and it is hard to make out the dimensions, but traces of a long cairn can be discovered in the surrounding heather. The court cairn near Tawnatruffan. The Easkey valley must have been a fertile region of the type favoured by neolithic cattle farmers. There are about 15 megalithic remains in this area between the Ox Mountains and the sea. Above is the remains of a court cairn just behind an abandoned farm cottage, not far from Tawnatruffan. The Giant's Griddle viewed from what was probably the cairn once attached to the dolmen. The Easkey river is about 100 meters beyond the monument.